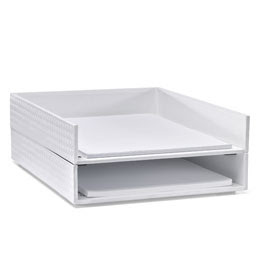 Stackable letter tray from The Container Store. As I wrote in an earlier post, I am really working to get organized. It's all part of a time-management, decluttering and streamlining streak I've been on. The most obvious benefit to me seems to be this: The more space and time for opportunity in your life, the more likely you will be available to pursue opportunity when it knocks. Additionally, if opportunity isn't exactly banging down your door, having time and clear mental space will give you the energy you need to create it. So for those of you looking to do the same, here's a little practical tip. I'm one of those people who by dint of my profession must swim in a constant sea of paper. Once I realized everything had its place, I realized I could sort my incoming paper in four pretty broad categories. It's amazing how much of my paper--probably 95 percent--fits into one of those four categories. Because it's vertical, things that need attention never get placed under another stack, rendering them invisible and therefore promptly forgotten. It also prevents horizontal paper-sprawl, which gives my little Ikea desk nightmares. Another advantage is that it lets me process things in batches. I don't have to shred something as soon as it comes in. Instead, when my shred tray is reasonably full, I take it to the shredder and deal with it in one chunk of time. Hooray for efficiency! The final benefit is more intangible: It just makes me feel better. I know where my paper goes, and I deal with the steady influx like a sane person, rather than as I used to, by pretending the paper simply wasn't there. Stack? What stack? Needless to say, that "system" wasn't really working for me. So there you have it. The humble letter tray has swooped in to improve my life. What organizational tools have you found to be most helpful? Keep tips like this coming by subscribing to Gimme Bliss. So a few weeks ago, I promised I would talk about how time management can help you on your journey to a better life. Some things should be obvious about why this is: Planning your time means less wasted time, and that alone can multiply your opportunities to do the things you really care about. There's also the idea that when you make a plan, you're also writing down your goals, though you may be doing it step by tiny step. So you want to write a book? You carve out 30 minutes each day to get some of that writing done. Your daily plan doesn't say "Write a Book," but it does say "Write." There's a strong temptation to want to break time up this way. IF I achieve X, THEN I can proceed with Y. While it seems logical enough, there's something desperately wrong with this equation. Unfortunately, our lifespans just aren't long enough for us to operate this way. We will die long before we achieve all the things we want to do, and if we follow the formula above, we will have put life--the very act of living and participating in this world--on hold. There will always be something we could figure out or achieve or complete before we can do X, Y, Z. If we operate in this way, we may achieve a few goals, sure. But we will live our lives out of balance. We will reach middle age and the end of our lives filled with regret. What's the solution? Time management. Why? Because it teaches us to balance all our needs and wants and desires into each day. It forces us to prioritize, and make the hard choices that we need to make. It essentially makes each day a microcosm of the universe that is our life: very full, but in equilibrium. So you want to start your business? Put 30 minutes somewhere in your day where you work on your business plan. So you want to read War and Peace? Make time to read for 15 minutes each day. If your spouse or your child or your exploding water heater screw up your plans, at least you had one. You can always reschedule something for tomorrow, but if you have no plan, you have no idea what you're supposed to be doing, especially with so many demands on our focus and attention. A practical note: I like Google Calendar for planning. It is easy to use, I can share events w/ whomever I choose, and I can print out daily agendas. I can also import public calendars, like I did with the American Public Holidays calendar, so I'm never caught off guard about what day a holiday falls on. There are many good calendars out there, this is just the one I use and like best. But if you're serious about getting your time under your control, set up a calendar today. I promise it'll be time well spent. Below is a small excerpt from something I wrote for a client. I think it fits in pretty well here. Hope you enjoy it. One of the most common mistakes people make when they decide to make a major change in their lives is confusing the tool they are using as the thing that will make them successful. To help you understand this bit of mistaken thinking, imagine a musician who has decided he wants to compose the next chart-topping song. Do you think that the musician believes that the hit song will only exist if he has a certain guitar, or the right drum kit or an expensive piano? Of course not. What the successful musician understands is that the potential for a #1 song is not held within his instruments, but within himself. He knows that even if his guitar disappeared, he would still be able to write the song. So how does this relate to you? Ask yourself if you’ve confused the tools—or “instruments”—in your life with your potential for success. Maybe you’ve read a book or heard a friend talking about how to create change and build a successful business or career, but then nothing seemed to happen for you, so you searched for the next book that would have better ideas, or talked to another person that could give you more advice. If only you had the right information, the right tools, you too could be successful. If you recognize yourself in this example, right now you should be asking one question: Why? Why haven’t I succeeded if I’ve been trying? The answer may be that you’ve invested too much power in the tools you’re using, and not enough in yourself. You are the only one who can succeed for you. No one else can do it for you, and nothing else—no tool, no advice—can make you succeed. They may help you succeed, but that’s a very important difference. · One way makes you think the power is external, coming from a source outside you. · The other way makes you think the power is internal, meaning that the source is you. Each is a mindset. Which one do you think enables more success? When starting out, you have to be able to tell the difference between what you can change using your own mindset, and what you can change with the help of a tool. Once you understand this, nothing can stop you from succeeding. Budapest has to offer in copious amounts. While I may be guilty of falling in love with my vacation destinations too easily, this one easily is at the top of my list. Of course, everyone loves vacation, though it's not so easy to take. But well, well worth it to go somewhere, anywhere, even nearby, so long as you ditch the cellphone, TV and Internet and settle into yourself, your surroundings and the undivided attention of the company you're with. In fact, though my husband and I hadn't been explicitly conscious of this fact, one of the things that we realized we traveled for was just this sense of timelessness. Losing track of one's mundane concerns, and elevating thoughts, conversations and awareness. Connecting with things, people, yourself in an uninterrupted way. Not only is it restorative, it's essential for insight. For me, vacation isn't about forgetting everything--though I can do that--but it hasn't been successful unless something dormant has been reawakened. For me, it's a need to get back in tune with my more creative endeavors. For you, it could be something entirely else. But unless you lay low for a while, you'll have a very difficult time recognizing what it is your life is missing. So vacate for a while--when you come back, your life will only be more full.